As someone who is constantly trying to combat a very oily t-zone with the latest and great mattifying primer, foundation or powder, I like to consider myself an expert in anything that makes my face less shiny. I’ve learned there is a fine line between glowing and greasy — just as there is a fine line between looking matte and powdery. I wanted to share some of my favorite setting powders that make their way through my makeup rotation or into my purse for touchups. I’ve had great luck with some of the translucent, white powders I’ve discovered recently. They look scary, but as long as you don’t plan on getting your picture taken with flash, these powders are very wearable day to day. From NARS to Sonia Kashuk at Target, there’s something for every price point. 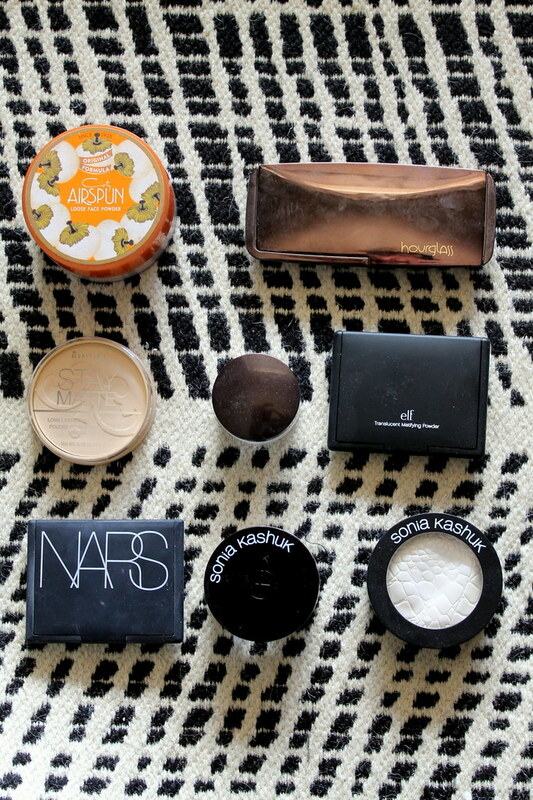 The one powder that I use every single day — no matter what — is the Coty Airspun Powder. It’s so good and inexpensive (less than $6), and if you can get past the granny-ish smell, it works wonders, especially when used with an puff applicator. If I’m looking for a little extra glow, I’ll pull out my Hourglass Ambient Lighting palette, and for on-the-go touch-ups, I turn to Rimmel’s Stay Matte Pressed Powder. I hope this helps! Any other powders you’d recommend for combating an oily complexion? Let me know in the comment section!